The variety of drivers available today is simply staggering. How do you know where to turn when there are great choices from every major manufacturer: TaylorMade, Wilson, Cleveland, Nike, Titleist, and of course, Ping? 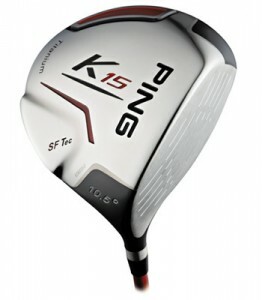 Despite the myriad of choices, don't fail to give the Ping K15 Driver model a try. Available in both a right and left hand version with loft options of 9.5, 10.5, and 12 degrees and three flex options (Light, Regular and Firm), there is bound to be a combination to suit your game. The shaft is the Ping TFC 149D, a lightweight option from Ping that was designed for use in their G15 series. The shaft uses lightweight materials and includes engineering to maximize performance for both flex and torque. This component of the club is a proven performer and a good fit all-around. Grip is the standard I9, rubber compound. Ping has three drivers in this line of clubs, and it's important to know where the K15 fits -- the i15 is for players that want to work the ball (the better player, typically), the G15 is for players who want some forgiveness and a higher launch angle (the high handicapper), and the K15 was designed for players that simple want to smash the ball to another zip code. The setup and face are neutral (i.e., no draw or fade correction built-in) and if you're that type of player, just "grip it and rip it" as they say. The reason the ball goes so far is because of the huge hot clubface. This is the biggest face of any of the Ping drivers to date. And the designers added weight near the heel and subtracted it in the crown. You see there is an external heel pad that makes up almost ten percent of the entire weight of the driver. To counter balance the added weight, they chopped off some of the rear in the crown. It is recessed which moves the weight lower giving the club a very low center of gravity. This helps you ball leap off of the clubface and fly high and long. Finally the crown is elongated, not flat, adding even more sizzle. All and all the distance of the driver is up there with the leading drivers on the market. I didn’t mind the elongated face as it still is very square. However, I don’t like the look of the recessed back and the added heel plate. It looks weird to me. That being said, the club is very easy to hit. The other downside is the sound. My father used to say that “children should be seen and not heard.” He sure wouldn’t like this driver because the impact is "heard" rather than felt. Despite an initial notion to the contrary, sound plays a huge part in our overall enjoyment of the game of golf; don't discount this aspect as something of little consequence, as this might be enough to deter you from this particular club.